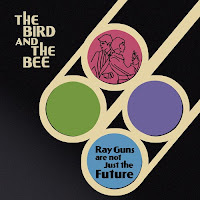 Atlas and the Anchor: The Bird And The Bee - "Ray Guns Are Not Just The Future"
The Bird And The Bee - "Ray Guns Are Not Just The Future"
The Bird And The Bee return tomorrow, when Blue Note Records releases “Ray Guns Are Not Just The Future”, the follow up to their acclaimed self-titled debut. Vocalist Inara George and multi-instrumentalist/producer Greg Kurstin expand on their melodic mixture of ‘60’s psych-pop, Tropicalia, and electronica, this time focusing in on the pop element and creating more dance friendly beats to bring more energy to their live show. Greg creates a musical space that is filled with so many different rhythms and styles from the past, it sounds like you have been warped to a ‘60’s Bachelor pad and Inara fills the space with her sly, humorous lyrics and sweet and stylish soprano. Together, they easily switch from a sappy, jazzy tribute to David Lee Roth on “Diamond Dave” to “Love Letter To Japan”, a bubbling synth-pop homage to the country itself, and the ragtime influence and honky-tonk piano of “You’re A Cad” into the tongue-in-cheek, apologetic, hip-hop inspired “Polite Dance Song”; The Bird And The Bee have created an interesting and fun record worth wearing out. Contest: Win signed Little Ones vinyl! Anya Marina - "Slow & Steady Seduction: Phase II"
Pronto - "All Is Golden"